How can Alliance help you? At Alliance Consulting International we see ourselves as partners with our clients. We realize that every project is different and every client has unique needs. We strive to clearly understand your priorities and find solutions appropriate to your objectives. Below is a brief description of our approach to some of our services. Click on the services below to learn more. Permit applications for air emissions sources, industrial wastewater discharge, stormwater pollution prevention, hazardous materials plans, and hazardous waste management. Alliance's Certified Industrial Hygienist, and Certified Safety Professional can assist employers in identifying and controlling health and safety hazards that could lead to lost-time accidents and illnesses, increase worker compensation costs, and represent a long term liability from employee exposures. Our industrial hygiene and safety services include job hazard analyses, exposure monitoring, ergonomic evaluations, regulatory program development, and bilingual training. We can assist you in complying with OSHA regulations, such as Hazard Communication, Injury and Illness Prevention, Process Safety Management, Machine Guarding, Lockout-Tagout, Confined Spaces, Fall Protection, Hazardous Waste Operations, Bloodborne Pathogens, Ergonomics, and other regulatory requirements. We assist legal counsel in conducting retrospective exposure assessments, site investigations, and providing expert witness services. Alliance's comprehensive environmental, health and safety audit programs provide the audited facility with an accurate assessment of its compliance status with regard to internal corporate policies, existing standards, best practices, and domestic and international regulations. We work with facility personnel and corporate EH&S managers to support their compliance program, develop customized audit checklists, perform periodic verification of corrective actions and conduct training. We provide post-audit technical support to help close audit findings. We are California ARB-accredited Lead Auditors for greenhouse gas (GHG) Emissions Reports Verification with extensive experience in general combustion sources, energy generation and cogeneration, geothermal power, and electricity transactions. Phase I site assessments for property transfers or acquisitions. Regulatory compliance reviews of operating facilities. Phase II site investigations, including sampling and analysis of soil, groundwater, asbestos-containing materials, lead paint and PCBs. Closure plans for decommissioned facilities. Engineering and Construction firms are required to develop and implement Site Health and Safety Plans for most public agency construction projects and for activities involving hazardous waste operations and emergency response (HAZWOPER). Alliance works with contractors in preparing, reviewing and updating site health and safety plans that meet the requirements of federal and state regulatory agencies including EPA, OSHA, DOT, US Army Corps of Engineers EM-385-1-1, Caltrans, as well as local jurisdictions. Our CIH/CSP certifications qualify us to approve site health and safety plans for projects involving clean and remedial construction, lead, hazardous waste, site characterization, and remediation, ensuring the protection of your workers and assets on the job. Complying with basic environmental and health and safety regulations is not enough to remain competitive in today’s global marketplace. Consumers are demanding green products and services, employees expect healthier work environments, and investors look for corporate sustainability strategies in selecting their portfolios. Companies of all sizes need to strive towards higher environmental and health and safety performance. Alliance Consulting International understands these challenges and has proven expertise in developing and implementing Environmental and Health and Safety Management Systems for domestic and international companies. We will help you develop a corporate EHS Management System that integrates regulatory requirements with your corporate and industry standards allowing you to track performance across the company using comparable metrics. 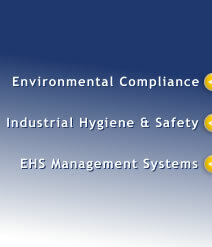 We work with your corporate EHS staff to develop a company-wide and site-specific regulatory matrix, a practical EHSMS manual, and a training program to roll out the system encompassing the full spectrum of EHS regulatory compliance requirements, corporate standards and best management practices as well as meaningful performance indicators. Following implementation we provide ongoing services to your facilities including making periodic evaluation visits, and providing regulatory compliance assistance to facility EHS staff. At Alliance we are committed to sharing information with our clients and colleagues through a range of services. We produce and deliver customized EHS training programs designed to your type of operation and location, and presented in English and/or Spanish to your managers, supervisors, subcontractors, and employees. We are an OSHA-authorized Construction Outreach Trainer for 10-hour and 30-hour courses, and our training topics include: Hazard Communication Standard; Fall Protection; Bloodborne Pathogen Program; Emergency Action and Fire Protection Plans; Injury and Illness Prevention Program; Hazardous Waste Operations and Emergency Response; Hearing Conservation; Confined Space Entry; Electrical Safety; Job Hazard Assessment, as well as Mexican Environmental and Health and Safety Compliance Programs.